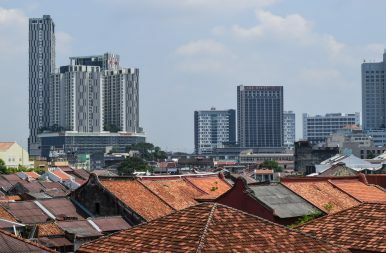 Melaka’s new skyline is in stark contrast to the centuries-old UNESCO protected rooftops and Chinese shophouses. MELAKA, MALAYSIA — While Melaka’s Portuguese, Dutch, and British architecture draws many of the crowds to the UNESCO World Heritage city in southern Malaysia, Melaka’s Chinese history is just as fascinating, as is its modern relationship with China. As the new government of Mahathir Bin Mohamad works to stamp its authority on Malaysia amid the ongoing legal proceedings against his predecesor Najib Razak, the former government’s trade and development deals made with China have come up for review, and in some cases stopped completely. This has included three projects that fell under China’s ambitious Belt and Road trade and infrastructure development program: the East Coast Rail Link, Multi-Product Pipeline, and Trans-Sabah Gas Pipeline. In Melaka, Chinese-supported construction is well underway, and appears unaffected by the change in government. The massive Melaka Gateway reclamation project along the city’s coast, including the creation of four islands for housing, offices, and a deep-water port, has not been stopped, and is having a large impact on the city and among its ethnically Chinese residents, explained Yam, a retired businessman now selling coconuts at the historic Portuguese-era St. John Fort. “The Chinese came here first in 1400-something, then the Portuguese in 1500-something, the Dutch in 1600-something, and finally the British in 1700-something. Now the Chinese are back,” Yam said. His own father had come to Melaka from China in the 1920s. “All of this is Chinese,” he noted, pointing in the direction of the new islands being constructed. “They are the only one investing in Malaysia. So long as they bring money I don’t mind. But not everyone is happy,” he added. According to Yam, Malay bureaucratic nepotism is fueling corruption in the city, and the vast sums of money spent on the projects are not improving local services or job prospects, especially among the 30 percent of the city residents of Chinese ethnicity. Shaw apartments, mall, and aquarium tower over the traditional Malay bungalows of Kampong Morten. Photo by Peter Ford. When the Portuguese conquered Melaka in 1511, the sultanate had already been trading with China for over 100 years. The sultan had married a daughter of the Ming Emperor of China, who brought some 500 staff, maids, and attendants with her. “The Chinese development in Melaka helps to slingshot Melaka in making [the city] great again in the marine and port industries,” explained Nazary Ahmad, former CEO of Melaka River and Coastal Development Corporation, who was recently ousted following the change in government. “It does benefit the residents in many ways, one of it is creating more jobs opportunities,” he noted in an email. But outside of manual jobs and concrete sales, the direct value to city residents of the new construction is unclear. The only completed building on Melaka Island drawing any visitors is the Melaka Straits Mosque, built on stilts to give it a floating appearance at high tide, and gaudily lit up at night. Whole neighborhoods of apartments and shops lie abandoned, with “for sale” and “to let” signs optimistically plastered to boarded up windows. The newly constructed faux-European The Riveria sits unused, yet towering over everything is the vast shell of a new mega hotel under construction. Hatten Place, a new hotel, mall and luxury apartment complex, towering over fishing boats in the Portuguese Settlement. Photo by Peter Ford. The negative consequences of the land reclamation and coastal construction can be seen in the nearby Portuguese Settlement. 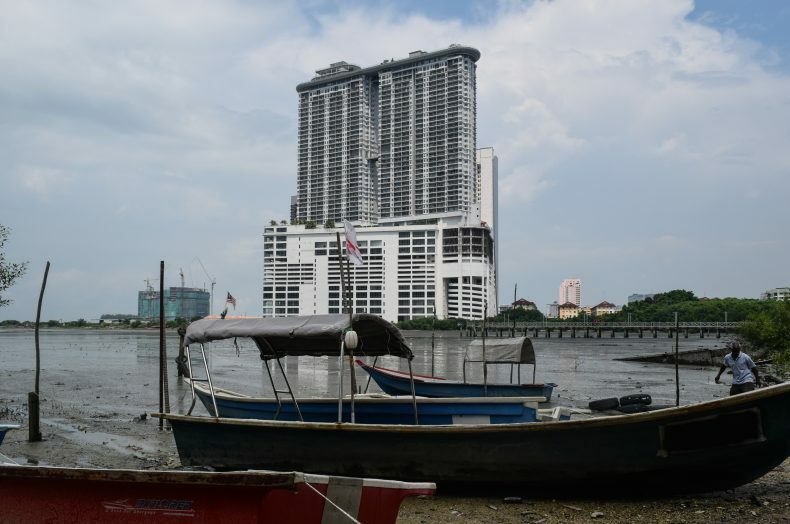 Home to the descendants of the Portuguese community, this Portuguese-Malay creole speaking fishing community is struggling to survive as the waterways and currents that they used to rely on are increasingly disrupted. When the Dutch defeated the Portuguese in 1641, the Portuguese buildings were mostly razed to the ground, but the Chinese community was spared. The British continued this trend when they took formal control of Melaka in 1824, by which point the Chinese quarter on the left side of the Malacca River was established and thriving. The Chinese quarter is one of the main attractions in the city, with thousands of tourists both foreign and domestic drawn to the shops and weekend street market of the UNESCO Heritage town. But Bukit China is the historic home of Melaka’s Chinese community. Dotted over the slopes of the modest hill, a quiet oasis in the bustling city, are some 12,000 Chinese graves dating back hundreds of years, making it one of the largest Chinese cemeteries outside of China. It almost became a victim of Melaka’s ongoing drive for development itself when government officials ordered its leveling in 1984. 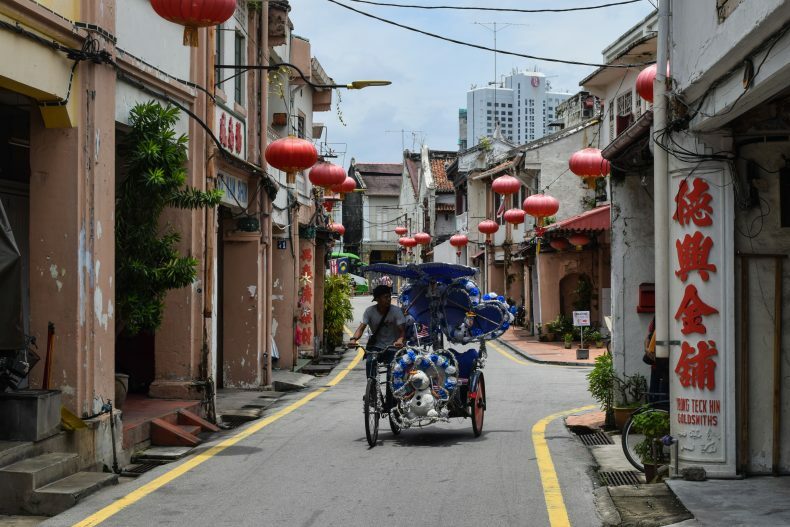 A bicycle trishaw driver looking for customers on quiet street in Melaka’s Chinese Quarter. Photo by Peter Ford. While the recent political changes in Malaysia caught China unprepared, it is unlikely that China and Malaysia’s close relationship will be overly tested. And yet stronger assertion of Malaysian claims in the South China Sea, and ignoring calls to send Uyghur refugees back to China, certainly suggest a shift in stance from the new government in Kuala Lumpur. 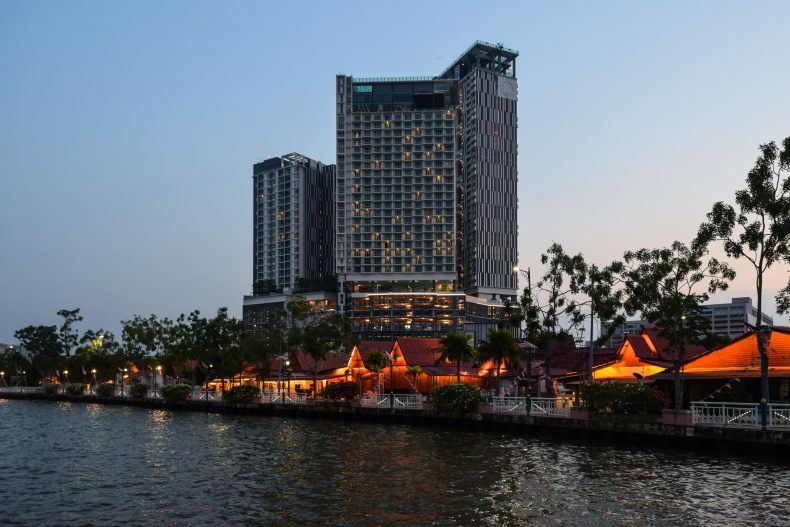 In Melaka’s historic old town, throngs of Chinese tourists clamber down from tour buses for selfies with the red-painted Dutch and British buildings, and to visit the nearby Hard Rock Cafe and H&M, both overlooking the cafes and tour boats of the revitalized river area. 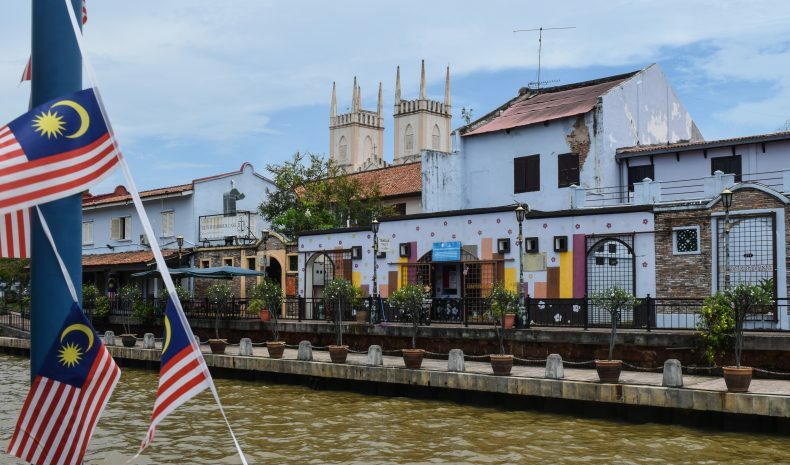 For Nazary, the renovation of the city’s once-polluted river into a tourist attraction is a point of pride for Melaka as it attracts more visitors, and seeks to preserve its history. “The river now plays an important role in promoting Melaka as a heritage city, since it curls up along the Heritage areas,” he said. The current riverwalk and river cruise is modeled on that of San Antonio in Texas. One block from the river, the local Chinese community ensures mainland visitors are able to continue speaking Mandarin as they shop, eat, and are entertained. The twin towers of Saint Francis Xavier Church as seen from the renovated riverside area in Melaka’s historic town center. Photo by Peter Ford. “You saw the big signs downtown that say you cannot smoke?” said local teenager Chen, looking around before taking a final drag on his cigarette and grinding it into the floor. In 2011, Melaka became the first city in Malaysia to ban smoking in public places, and seven states now have similar bans.